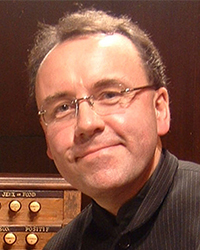 A former Director of Music of Gloucester Cathedral, David Briggs has made something of a name for himself as a creator of large-scale improvisations. From a compositional standpoint, they’re generally contrived and unoriginal; Briggs—like fellow organist Wayne Marshall—has a penchant for creating music in the styles of others, rather than forging an individual style of his own. Also like Marshall, his musical personality tends toward the extravagant, but while in Marshall’s playing the results are reckless and repulsively showy, Briggs manages to focus this quality, bringing a breathless exuberance to his performances. Most remarkable of all, though, is his technique with the instrument, which is simply amazing. Here’s an interesting, quasi-improvised Symphony in Four Movements that dates back (i think) to the early 2000s; very much in the French style, it’s performed on the gorgeous organ of Gloucester Cathedral. The acoustic isn’t always sympathetic to the more densely intricate passages of counterpoint, but the broader gestures sound very impressive indeed.